Excessive Post-Exercise Oxygen Consumption (EPOC or “Afterburn”) is a hard to say, misunderstood, and important phrase being incorrectly thrown around gyms nowadays. However if you are interested in burning calories while you lay on the couch after your workout is finished, keep on reading! From the time you begin a workout to the hours after its complete, you are burning more calories than normal as you intake and process oxygen at an elevated rate. While we are all focused on burning calories during our workout, we also have the ability to drastically increase our exercise’s impact by burning calories at an elevated rate after it ends. To do this, we need to push our exercise deep into an anaerobic zone (you can’t breathe fast enough to sustain the activity) for short periods of time, with our heart rate above 70% of the max rate. By doing this, a few important things happen. Simply put, the harder you work, the more oxygen you require, and the more calories you will burn to gather that oxygen. With your body requiring 5 calories to consume 1 liter of oxygen, the more you breathe = the more you burn! As you exercise harder, your heart rate climbs into an anaerobic zone and your breathing rate increases. When working anaerobically, your body cannot process oxygen quickly enough to sustain that level of activity. To keep up, your body will recruit as many ATPs (more on this another day, but they are your body’s primary energy carriers) as possible. EPOC, at the highest level, is the amount of oxygen required after exercising to restore your body to its normal, resting level, and replace those ATPs while eliminating oxygen debt. Simply, your body will be required to take in oxygen at an elevated rate after you finish exercising, because you worked harder during the workout. As soon as you finish your workout, your body recovers by producing new ATP in order to replace the ATP used during your workout. During hard, anaerobic work, your body will use more ATPs, requiring more to be created. To do this, your body must consume more oxygen than you would normally require in a resting state. To boil this down, intense and highly anaerobic work is required to generate a meaningful amount of EPOC. At Total Row, we keep sets short and varied so you can get into these prime zones and stay there. The next time you feel yourself slogging through a generic workout routine, spice things up with HIIT sets and short bursts of intense cardio! 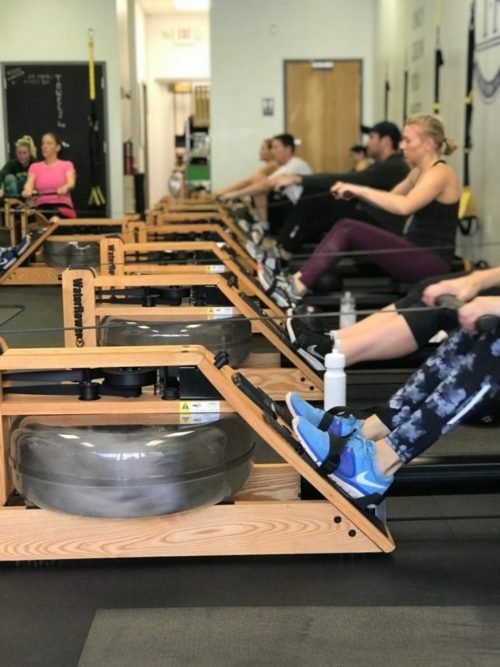 Better yet, come join the nearest Total Row class!